Don't call it an invasion - it's just three records of note from across the pond. Slug - Ripe Before XTC was XTC they were the Helium Boys and that name might better convey the contents of this terrific album. There's certainly nothing sluggish about the brainy and effervescent avant pop dished out by Ian Black and the crack cohort he has drafted in service of realizing the sounds in his head. Black has played bass in a touring version of Field Music, and if you're a fan of that band you'll find much to love here, especially in the brilliant drumming of Peter Brewis. Brewis and his brother David also produced the album, giving it a very live but highly detailed feel. You get the idea that all involved were willing to try anything to make each short song as memorable and action-packed as possible. The album begins with Grimacing Mask, a pensive little overture that slides right into Cockeyed Rabbit in Plastic, which combines angular rhythms and high-pitched vocals to great effect and even manages to shoehorn in a snaky guitar solo in its 2:47. Classic. Sha La La has a touch of exotica and suspends dreamy vocals over some sturm und twang, and Eggs and Eyes is a sprightly romp. Greasy Mind has a dark undertow that comes to the surface in the form of some wonderfully brutal guitar and Shake Your Loose Teeth starts off with Morricone-esque suspended chords before opening up with nice harmony vocals and sweeping melodies. I'm not sure it was necessary to include Weight of Violence, a steel drum instrumental, but it's over fairly quickly and then we're back in the thick of things with Running To Get Past Your Heart, which is like a Motown song gone wonderfully wrong. Peng Peng, another instrumental, features glassy and atmospheric piano, a little to the left of the lounge, as well as a touch of slide guitar and is simply gorgeous. The album ends with Kill Your Darlings, as dramatic as the title suggests, and At Least Show That You Care, a malevolent, dub-infected capstone to a most engaging debut from Slug. 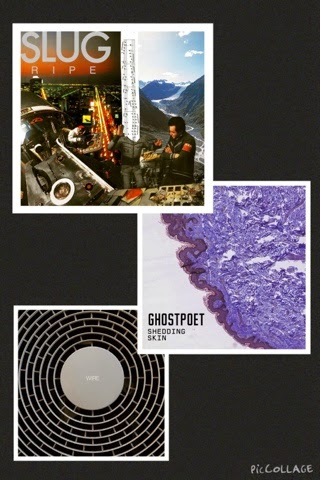 Ghostpoet - Shedding Skin I've had my eye on Obaro Ejimiwe since his debut album was nominated for a Mercury Prize in 2011, but always filed his stuff under "interesting" without particularly connecting. That first album plowed some of the same furrows as Tricky, with spoken-word vocals over noirish soundscapes, while the second album added more electronics and occasional female vocals. Now on his third album he seems to have pulled everything together, making a huge leap forward and clambering out of "interesting" into essential. Right from the opening track, Off Peak Dreams, there's a new sense of purpose combined with a musical structure that is highly compelling. After a soft voice speaks some words in Japanese, questioning piano chords lead into jazzy drums, hooky guitar patterns and Ghostpoet comes in, rapping more than reciting and when he says "I'm ready to roll," you believe it. X Marks the Spot features vocal sweetening from Nadine Shah and has an epic flair that belies the chorus of "I don't care anymore," and Be Right Back (Moving House) is long and beautifully lonely and finds Ghostpoet honing his speak-singing to nearly as fine a point as Lou Reed did on his later albums. The title track is spooky and hypnotic, with spare guitar and keyboards augmenting a foundation of pure bass. "You think you know me, you never know me," Ghostpoet repeats, voice barely limned by Melanie De Biasio's singing. By the time we get to Yes, I Helped You Pack, with it's barely contained rage, a bit of a backstory to the album begins to develop. There's been a failed relationship, with emotional wounds dealt out by both parties and several lives disrupted. Shedding Skin may not really be a concept album but its certainly a series of postcards from the same ledge. That Ring Down the Drain Kind Of has Nadine Shah singing "I'm back where I started" and features cutting guitar straight out of Once Upon A Time In The West. The slightly nasty sentiment of Sorry My Love, It's You Not Me is softened by Lucy Rose's singing and Ghostpoet's question: "I want to feel magic in the stars again - is that too much to ask?" While Ghostpoet doesn't quite find light in the darkness by the end of Shedding Skin, he does muster up a grim determination shot through with hope. On album closer Nothing in the Way he tells himself "We all fall down, but when we get up, nothing in the world can stop us. It's what I believe." And as the strings swell, you will, too. Wire - Wire On their last album, Change Becomes Us, post-punk legends Wire revisited material left unfinished after their very public dissolution in 1979 - but it was in no way a retread. In fact it was one of their best albums, exploring new emotional terrain in a pristine and powerful production. Unfortunately, the same cannot be said for Wire, their self-titled new album. While it's not airless and arid like 1990's Manscape, a far worse failure, it does make me feel similarly that they are coasting. Although these are all new songs, either developed on tour or handed to the band by Colin Newman just prior to recording, there is a pervasive sense throughout that we've been here before. Melodies feel undercooked, the arrangements are fairly rote and the mastery displayed on their last three albums seems to have been replaced by complacency. While Wire is not unlistenable by any stretch, it feels like just another Wire album and, after Change Becomes Us and the three great albums that preceded it, I expected so much more. I left for Brooklyn with two boxes on my belt, one with 7,134 songs on it and other with 3,810. Given an Internet or cellular connection, the second one gives me access to millions of songs on Spotify, YouTube, BandCamp, SoundCloud among other services and apps. That's not to mention a few thousand CD's and several hundred pieces of precious wax that I can dial up anytime I'm at home. 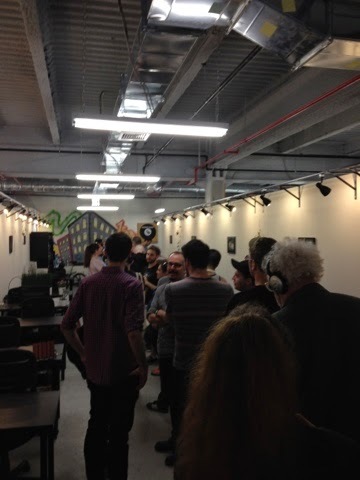 So why in God's name was I going to sit on the subway for an hour to head out to Permanent Records on Record Store Day? 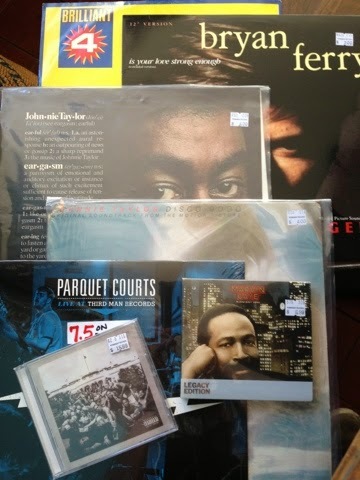 In my other Record Store Day posts (see below) I've talked a bit about the unique engagement with music provided by a visit to a music emporium. Going out on RSD is an opportunity to see more people while doing so, and take the pulse of this sacred activity. 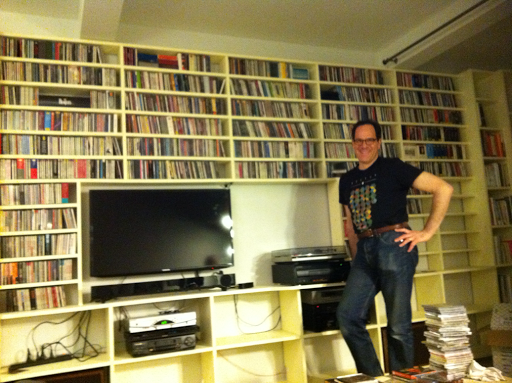 This year, I also had the slightly practical consideration of 18" linear inches of CD's I wanted to unload. They're good people at Permanent, and even though they wouldn't give me a lot for the pile, which was mostly Mojo Magazine compilation discs, I knew they would be fair about it. I got a little more than I bargained for on the "see more people" part of the equation. When I arrived at Permanent Records about 30 minutes after opening, there was a crowd waiting in the blazing sunshine just to get upstairs. I don't usually pack sunscreen in my blog bag so I got slightly roasted. I did have a chance to chat with some of my fellow travelers, including a woman who mentioned that she was reading Viv Albertine's memoir. That's a book I've been meaning to get to and based on her description I need to read it soon. I told her and her boyfriend about the time The Slits played Irving Plaza and it was unexpectedly one of the best reggae shows I've ever seen. They went from faking it to make it to being the real deal in pretty short order. The line moved slowly but we finally made it to the tiny elevator, which was part of the cause of the delay. The stairs are not available from the lobby so we shuttled up in groups of six, getting upstairs to find...another line. Permanent Records used to have a storefront in Greenpoint but high rents drove them to find their current space, a charming room in the back of Brooklyn Works, which provides desk and office space for rent by the hour to the creative and entrepreneurial classes. Talk started to turn toward what RSD exclusives people were hoping to find. Even though I am one of the 12 people Lars Ulrich referred to as being able to play the limited cassette version of Metallica's demo tape, I didn't pay much attention to the releases this year, preferring the thrill of serendipity. The guy ahead of me was hoping to score something by the Foo Fighters, and another was looking for Springsteen reissues. Needless to say, I couldn't relate, but was glad to see at least one of them find their joy. Once in the store, I did take a perfunctory look at the box of special releases, conveniently placed near the front. I considered Brian Eno's My Squelchy Life, on vinyl for the first time, but from what I recall this material was unreleased for a reason. The tracks that trickled out on compilations were not among his best work - and there's the fact that it was issued digitally last year as part of a big campaign by Eno's All Saints record company. Not worth my $30. The rest of the box had plenty of Springsteen, and Willie Nelson's Teatro, which never quite lived up to the expectations provided by having Daniel Lanois at his peak in the production chair, and a couple of other things of minor interest. I quickly turned my attention elsewhere and almost as quickly spotted a copy of Parquet Courts Live At Third Man Records, a vinyl-only release taped at Jack White's spot down in Nashville. The "7.5 on Pitchfork" sticker helped catch my attention, I admit. That's good indie store practice. Parquet Courts are a great live band so even the prospect of lining Jack's pockets couldn't keep me away. Hopefully the band is getting the bigger cut. I also grabbed Kendrick Lamar's To Pimp A Butterfly. True, I can listen on Spotify, and maybe it was two bucks cheaper on Amazon, but since it's a important record that's worth owning why not support Permanent in the process? That's when the serious flipping through new and used stuff began. There was a CD of Colossal Youth by Young Marble Giants for $4, which I pulled out and tried to hard sell to the Viv Albertine reader. "If you like The Slits, you'll probably like this. It's one of the greatest albums of all time!" She had never heard of YMG and was intrigued - but there was a catch: "I don't have a CD player." Nope - not even in her laptop, since she just bought a MacBook Air. Ladies and gentlemen, the post-CD era is real. Not for me, however. I was happy to find a copy of the Legacy Edition of Marvin Gaye's Midnight Love, an album I've been meaning to get to know better. The double-disc versions of What's Going On, Let's Get It On, and I Want You are some of the finest reissues of their kind, with great bonus tracks and informative liner notes, so my hopes are high. I recently read in Mojo that soul great Johnnie Taylor was the first artist ever to be awarded a Platinum single, for Disco Lady in 1976. Apparently Taylor himself was none too impressed with the song, which features a rhythm track by P-Funk legends Bootsy Collins, Bernie Worrell (billed as George), and Glen Goine. "My voice is too low, the record doesn't suit me and I think we need to go with something else," he told his producer. Soon Disco Lady was Number 1 for four weeks and Taylor was literally bathing in Champagne. While I didn't bust out the bubbly, I was delighted to find copies of both Eargasm, the album containing Disco Lady, and one of its follow-ups, the soundtrack to Disco 9000, on vintage vinyl. If you know me, you also know that I'm excited to report that the other bassists on Eargasm are Michael Henderson of Motown and Miles Davis fame, and Muscle Shoals's own David Hood. Four string nirvana. Finally, I delved into the ultimate hit-or-miss bins, with the dollar and two-for-one records. I actually scored, discovering a 12" single of Bryan Ferry's Is Your Love Strong Enough. Some of his best 80's work was for movies or only on singles so I'm always on the lookout for ones I don't have. I also selected a 12" of Wait For It Megacity Mix by Brilliant, which may be the last thing the Killing Joke spin-off released before becoming a New Romantic pop nightmare. The best news is that I have plenty room for these vinyl additions, having sold a stack of wax to Permanent a few months ago. It all came full circle when I saw a heavily tattooed shopper buy the copy of Sham 69's Hersham Boys that was in that stack. Looks like it found a good home. As I paid, I chatted with the proprietor and cashier of Permanent and it seems like things are going well in the still newish space. While its small size made the RSD crowds a logistical challenge, they seemed to take it in stride and were ringing up some high value sales. I wondered what had been the most obvious object of desire among the exclusive releases. "Brand New," they both said practically at once. Huh? Turned out they were referring to Deja Entendu, the second album by Long Island Emo-punk band Brand New. Originally released in 2003, it is apparently very hard to find on vinyl, and they have rabid fans, like the guy who showed up at Permanent at 4:30 AM to get his copy. I like to picture that guy, carefully removing the holy grail from the glossy sleeve, and placing it on his turntable. As the power cords and slightly whiny vocals fill the room, he begins to dream of what he will find next April. See you then, brother. Alex Lipowski, percussionist for Talea Ensemble, entered the ornate room at The Italian Academy on Amsterdam Avenue dressed all in black with a small Chinese gong strapped to his chest. This is a trademark of composer Pierluigi Billone, whose work the group was playing last Wednesday night. It's a brilliant move, that gong, serving to turn the musician's body into an instrument and lending a ritual flair to the performance. There is also a puckish wit to it, and a reminder of the composer's ultimate control over the work. Lipowski was opening the show with Mani.Matta (2008), one of a series of solo percussion works Billone has composed. Mani means "hands" in Italian and Lipowski did sometimes use his hands directly on the gong, as well as on the woodblock, log drums and marimba that made up the rest of his kit. More often he used a variety of mallets, sometimes two to a hand, displaying extraordinary technique as he flawlessly executed the difficult patterns. Most remarkable was how Lipowski found the pulse that Billone laced through the work, a kind of connective tissue that was more felt than heard. While there were a lot of hard, sharp sounds in the piece, there was a spellbinding section when Lipowski employed these huge, soft mallets to caress clouds of sound out of the wood. It created an atmosphere in the room that I could have existed within for a very long time. Mani.Matta is a fairly long work at about 20 minutes and Lipowski threw himself into it, for a splashy, engaging performance. I'm looking forward to listening to it again in the recording by Adam Weisman, a Billone collaborator. You can also see an excerpt of Lipowski's world-premiere performance of Billone's Mani.Mono for springdrum here - fantastic stuff. The second piece we heard was Ini (2003) for solo bassoon, the third section of Legno.Edre, a five-part work that lasts over an hour. However, Ini had never been performed before and we had the privilege of hearing it come to life more than a decade after Billone completed it. Adrian Morejon was the soloist and he had complete command of the extended techniques used by Billone. There were honking sounds and high, whispery effects, and an overall sense of tumult. Legno means "wood" in Italian and it is a long tradition to impart anthropomorphic qualities to trees, which is where I found my mind drifting as I listened. "Would it be nuts to say Billone's Legno.Edre is an elegy for the wood that created the bassoon?" I tweeted when the work ended. Not nuts, I say. Listen for yourself to another section of Legno.Edre performed by Chris Watford. The final work was a U.S. premiere of Ebe and Anders (2014) for seven instruments, including two percussionists wearing gongs. They mirrored each other on either side of the stage with similar but not identical arrays that included a lot of metal, including large sheets of steel or iron. While Billone considers the trumpet and trombone the soloists in Ebe and Anders, it was impossible for the incisive clanks of the large metal sheets not to dominate. Occasionally, they traded sounds like dueling swordsmen, lending an air of gladiatorial combat to the music. The brass, along with electric guitar, piano and cello, sometimes provided relief from the hard textures of the percussion and sometimes exacerbated the industrial textures with brief explosions. Lipowski's partner in crime was Matthew Gold, and joining them was Jeffrey Missal (trumpet and flugelhorn), Mike Lormand (trombone), Stephen Gosling (piano), Oren Fader (guitar), and Chris Gross (cello). All the players were excellent and navigated Billone's twists and turns with aplomb, ably conducted by Eduardo Leandro. The writing for piano, cello, and guitar was so advanced that they often sounded as one, although there was a moment when Gross dealt out a nasty riff that probably made Fader (and any guitarists in the audience) completely jealous. The sense of ritual moment defined by Mani.Matta continued throughout Ebe and Anders, making the audience something more than just listeners. 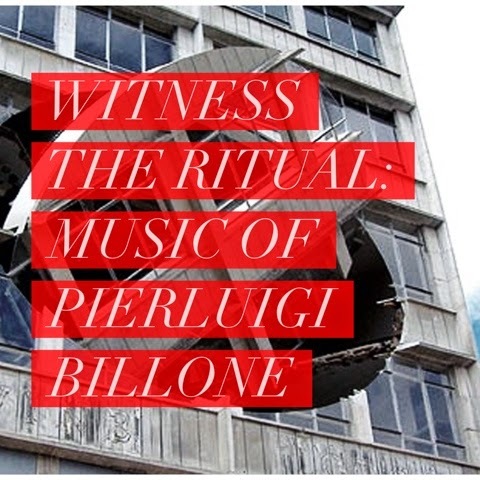 We were witnesses, actively engaged in bringing Billone's extraordinary music into the open. I felt lucky to be a part of it. You can hear Klangforum Wien perform Ebe and Anders here. The background to the image above is by the American artist Gordon Matta-Clark, the dedicatee of Mani.Matta. After the frenzy of year-end lists, AnEarful went a bit quiet as my family launched into an extensive apartment renovation. While (maybe) not as stressful as moving, this project required our full attention. I'm very lucky to have a wife who understands my passion for music and so a centerpiece of our living room is now an enormous wall unit that absorbed all of my CD's and will soon house all my LP's as well. This is not a collection to be dusted off from time to time. It is a library that I engage with on a daily basis, helping me make different connections and discoveries the same way shopping in a record store does as opposed to buying or streaming online. Fortunately, thanks to Spotify, Freegal Music and other sources, I have kept up pretty well with what's been going on this year - I just haven't had time to write about it. As usual, I have an "Of Note" playlist on Spotify where I dump anything that catches my ear. You can subscribe to the playlist to follow along as I add (and sometimes subtract) songs. If you do, let me know what I might be missing out on! To bring things up to date, here's an attempt at a breezy overview of 2015, quarter one. 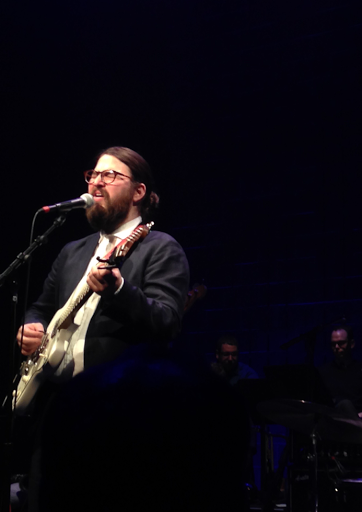 Matthew E. White at BRIC last month. In addition to the Kate Tempest show I covered recently, I feel privileged to have made it to two other concerts during this busy time. Father John Misty slayed at Rough Trade back in February. No surprise there, as I've seen him twice before and he's one of the great performers of our time. I still can't get over how he and his excellent band launched into the title track of I Love You Honeybear as if they were slamming home a four-hour epic concert. And his version of Leonard Cohen's I'm Your Man fit him as well as his stylish jacket. Just three weeks later, I slogged out to BRIC for a Matthew E. White extravaganza, with all the horns, strings, and backup singers you could want. This was the third time I've seen him as well and it was everything I've ever hoped for since the first time I heard Big Love from his debut. Listen for yourself, thanks to WFUV. More to come: Talea Ensemble at the Italian Academy on April 8th and Natalie Prass at Bowery Ballroom on May 4th. There are 43 tracks in the Spotify playlist so far. Obviously, three of them feature Kanye West, who is working his way towards a new album. Not so obviously, two of them have Paul McCartney, who seems to be having a ball, and even Rihanna sounds appealing on FourFiveSeconds. Keep Kanye away from awards shows - in the studio he can do very little wrong. He might have gone back to his Pro-Tools, however, after hearing To Pimp A Butterfly, the astonishing album from Kendrick Lamar. While at times it sounds like the greatest album OutKast never made, it triumphs through density, complexity, layers of emotion, and a gorgeously funky, wide-ranging production. Lamar has single-handedly made 2015 a good year for hip hop - with an assist from Ghostface Killah, who teamed up with Canadian noir-jazzers BadBadNotGood on Sour Soul. He sounds newly enlivened by the surroundings and is on point throughout, especially on the Donald Goines homage, Tone's Rap. It's hard to imagine that I won't still be listening to both of these come December. I've already mentioned Father John Misty and Matthew E. White, who have both blown through any sophomore issues with great follow up albums. Each is worth getting on vinyl, FJM's I Love You, Honeybear for the mind-blowing packaging (warped vinyl and all), and White's Fresh Blood for the bonus disc of stripped down versions. While White's arrangements are spectacular, they wouldn't mean anything if the songs weren't so damned good. Both of them mine 60's and 70's sounds to great effect, which can also be said of Ryley Walker, a virtuoso guitarist making a move to wider exposure with his second album, Primrose Green. He's been covering Van Morrison's elegiac Fair Play in concert, which is a great point of reference, as is Tim Buckley, Nick Drake and Fotheringay. It's an old sound that never gets old. The production is lush and Walker pushes his voice and his band hard, breaking prior restraints and landing in a deeply emotional place. You gotta hear it. Matthew E. White has also gifted us with the debut of Natalie Prass, surrounding her songs of heartbreak with a variety of settings, from his patented take on symphonic soul on several songs, to a string quartet and harp on Christy and pure classic Disney orchestration on It Is You. Dusty In Memphis comes to mind, and although Prass is more of a quirky chirper than the legendary Ms. Springfield, they both have a similar steel to their delicate spines. Possible best-new-artist stuff. Speaking of which, Courtney Barnett was one of the surprising delights of last year and now we have her first official full-length, Sometimes I Sit and Think, And Sometimes I Just Sit. Many reviewers reference Nirvana when talking about Barnett but I prefer to leapfrog right back to deadpan pop-punk of The Vaselines. In any case, Barnett's trademark storytelling, off-hand delivery and overall pluck are honed to fine point here, along with her guitar playing, with both more abandon and more polish to the sound. Promise delivered, further delight guaranteed. Chastity Belt never seemed that promising to begin with, but Time To Go Home is a nice surprise, tuneful and reflective. Psychedelic sounds have gradually returned as a regular part of the landscape. This isn't always a good thing as the result often sounds like an ill-fitting costume, but three albums out this year make a strong argument in favor of keeping modern psych around. The Amazing spin out an elegant, filigreed sound on Picture You that slowly creates a distortion in the atmosphere. While the vocals could be stronger, most of the time the intertwining guitars are shouldering the load anyway. Pond, whose Hobo Rocket was an overlooked gem back in 2013, are back with Man It Feels Like Space Again. 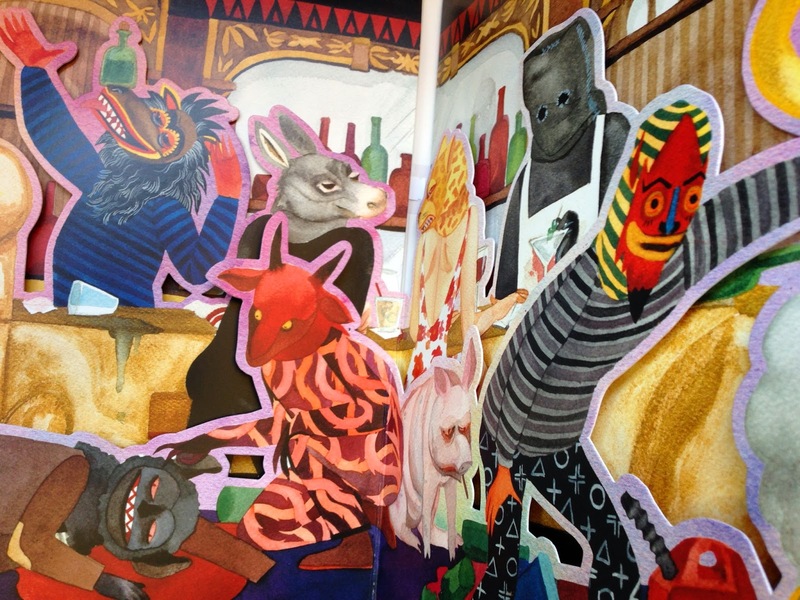 The production gleams with confidence and the songs are both muscular and wonderfully weird. Finally, we have Wand, who make seismic noises for connoisseurs of amplifier hum like me. Golem is their earth-scorching second album and the charred trees that surround it in an ever-widening circle look...beautiful. Funny to think of a time when synthesizers seemed to threaten the natural order of things. Now they're used for retro-leaning music as often as an upright bass and a hollow-body guitar. It can be a wonderful thing when it works, such as on the electro pop of Father John Misty's True Affection, but pretty dreary elsewhere. James Greenwood, who performs as Ghost Culture, takes us back to The Factory on his self-titled debut, building up rich layers of keyboards and ticking rhythms and singing over them in an airy, disaffected tenor. His album succeeds because he seems not to care a whit what anyone thinks, as if he's saying "I'm 24 and this is all new to me. Come on and dance!" Why say no? A lot of the music above is from people in the earlier stages of their careers. That could certainly not be said of Björk, now the subject of a retrospective at MOMA after all. Vulnicura is her seventh album since Debut and her third in a row that I find myself mostly admiring rather than loving. I'm a fan of art song as much as the next guy, but these pieces often come across as slightly formless, leaning a bit too much on the sheer beauty of the sound and the diary-like intrigue of the lyrics. Arca, who produced some of it, fell in the same static trap on his album last year. Björk's voice is in top form, at least, but I certainly don't need Antony intruding on my reverie. I don't know what she - or anyone else - sees in that guy. Lastly, it all comes down to Bob Dylan. The day is growing ever nearer when we will look back and marvel that we ever shared the planet with such a titanic artist. But until then, he's right in the thick of it, planting his flag in the culture of today just as firmly as in decades past. He's always been indebted to and recharged by the songs of the past, so why not an album of Tin Pan Alley songs associated with Frank Sinatra? Dylan's affection and admiration for Sinatra has been clear ever since his moving performance of Restless Farewell at Frank's nationally televised 80th birthday celebration in 1995. Also, his voracious appetite to discover the structure of songwriting must have led him to look pretty closely at the Great American Songbook from time to time. As far as comparing his voice with The Voice, Dylan had this to say in his intense interview in AARP Magazine: "Comparing me with Frank Sinatra? You must be joking." But Shadows In The Night is no joke. Brilliantly produced by Dylan (as Jack Frost), each song is set in a charcoal sketch of swaying bass, strummed guitar, and pedal steel (the great Donny Herron), with glints of other sounds and textures. Dylan embraces the songs, in all their theatricality and old-fashioned romanticism, while also holding them slightly distant, as if almost amused. His voice sounds clear and even supple without hiding any of its well-worn qualities as he navigates the sometimes dramatic melodies. In the end, Shadows In The Night is a mood piece. Give it a chance and it will mesmerize you. What have you been listening to in 2015?